In the last paragraph of the first chapter of The Secret Life of Pronouns, James Pennebaker makes a confusing statement: “If you are a serious linguist, this book may disappoint or infuriate you.” This sounds discouraging, especially in these days of pop pseudoscience books, which are all theories and no facts. If Pennebaker is already throwing in the towel to “serious” readers, is it really worth reading on? organized around some of my favorite topics in psychology and the social sciences – personality, gender, deception, leadership, love, history, politics, and groups. The goal is to show how the analysis of function words [like pronouns, articles, and prepositions] can lead to new insights in each of these topics. At the same time, I want you to appreciate ways of thinking about and analyzing language. No matter what your personal or professional interest, I hope you come to see the world differently and can use this knowledge to better understand yourself and others […] Although the analysis of language is the focus of this book, it is really a work of psychology. Whereas linguists are primarily interested in language for its own sake, I’m interested in what people’s words say about their psychological states. Words, then, can be thought of as powerful tools to excavate people’s thoughts, feelings, motivations, and connections with others. With advancements in computer technologies, this approach is informing a wide range of scholars across many disciplines – linguists, neuroscientists, psycholinguists, developmentalists, computer scientists, computational linguists, and others. So I’m guessing that Pennebaker is trying to guard his book against criticism from serious linguists, but while that may be the case, I think his worry is unfounded. It’s true that there are non-fiction books out there that should do themselves a favor and ask not to be read critically, but it is also true that there are some very interesting linguistics books that can be enjoyed by both the general public and serious linguists alike. Pennebaker’s book falls into the latter category. 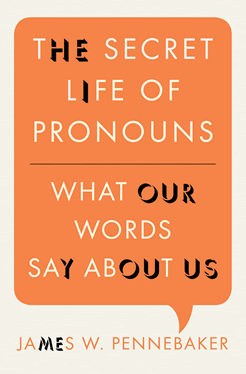 Even if I feel that some of his analyses called for more detail or data, The Secret Life of Pronouns is after all a book aimed at the general public, not a scholarly article. I would recommend this book to anyone, even serious linguists. Up next: The Language Instinct by Steven Pinker, which is the first post in a series about this topic. I am using part of this book to support my thesis on the French subject pronouns “tu” “vous” and the more common us of “on”. Thanks for sharing! No problem. I’m glad you liked it. I will also use part of this book (or the studies it references) in my thesis on discourse in advertising texts.